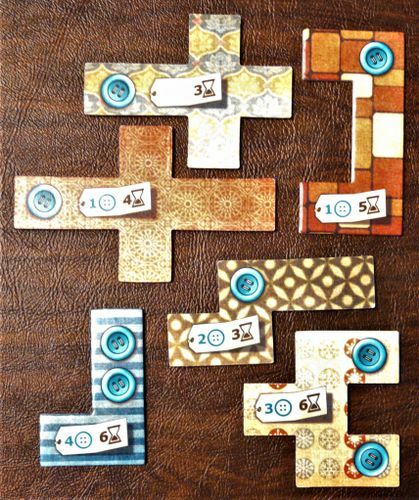 Patchwork can be approached as having three phases. The beginning phase has the challenge of being button poor and usually lasts until the 4th button income spot. During which a button engine should be the priority. The middle phase from the 4th income spot until the past the 6th income has most patches evenly valued. After that the patches with no buttons have the best value. 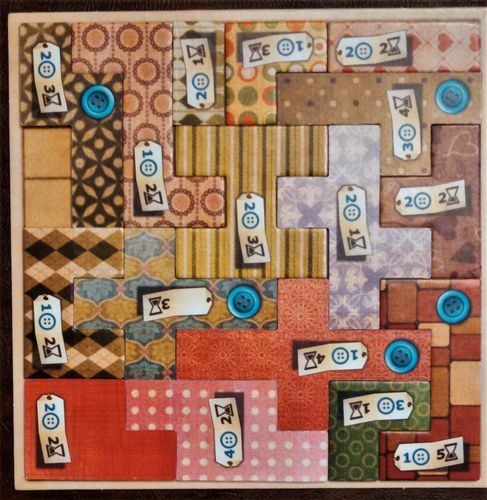 Examples; the quilt below with the best order of patch placement is worth a final score of 26 points (no single patches and no 7x7 bonus). It has all the no button patches and an okay early button engine. The next quilt with best order placement scores 68 points (no singles or 7x7). It has a very good early button engine and many no button patches. The ‘best’ patches are different as the game goes on. They could be thought of in 4 groupings; the early group which are best at solving the button shortage problem quickly. They have a high button income to button cost ratio. The early/midgame patches can be placed once there are enough buttons available. They also have the good payback if place in roughly the first half of the game. They gain as many points (income and square coverage minus button and time cost) as the ones above but are harder to get placed in the 1st half of the game. The next group is the late game group which is the patches with no buttons. No picture. The remaining patches are a lower tier having the problem of not usually getting out early enough or not having a good payback. Though most of the patches have easier to fit in shapes. The random order of the patch availability and the competitive nature of the game typically keeps the best patches out of reach. But hopefully it helps to know what to shoot for. I'll have to disagree to some extent with your patch categorization. Some of the no-button patches provide the best value in the entire game and are almost a must-pick if they're available, so I wouldn't group them all under a "late game" label. Similarly, the last picture you posted (which you defined as low-tier) contains several high-value patches that I would even consider picking early in the game. In fact, I don't even agree with the game having three phases. You've got an initial phase trying to build an income engine that is just enough to afford the best patches available later on while spending as few advancements as possible, and from that point onwards the game is just a battle for the best value (including strong mutual piece denial) until the end. If any, the third phase could be defined as the optimization of the last 1-2 moves, in which you try to maximize the benefit of not having to "pay" the full advancement cost of the last patch you place. I play this game with my wife and kids....why on earth would you need to try and make this into a seriously strategic game? Having fun is not mutually exclusive with trying to seriously strategize. Seriously strategizing IS fun for many people. I’ll second this. I bet serious considerations were given to strategy during the design and development of this game. So why can’t players of this game also give consideration to strategy if we so desire? It is after all rated the number one abstract strategy game (which I don’t necessarily fully agree with, but still). What an absurd comment. It is after all rated the number one abstract strategy game (which I don’t necessarily fully agree with, but still). What would you rate #1 abstract? First of all, I’m not entirely sure I would even call Patchwork an abstract. It has an economy/engine building aspect that abstracts typically don’t have. But it does have the strategic elements associated with abstracts, hence the above analysis is totally warranted. But abstracts I would definitely place ahead of it: Hive, chess, go, and the games in the Gipf series. For me personally, Hive is probably my favorite. What an absolutely bizarre response. Really now, someone put strategic thought into this game, and then wrote about it. Heavens. And in the Strategy forum, of all places! I have to disagree with the strategic advice. 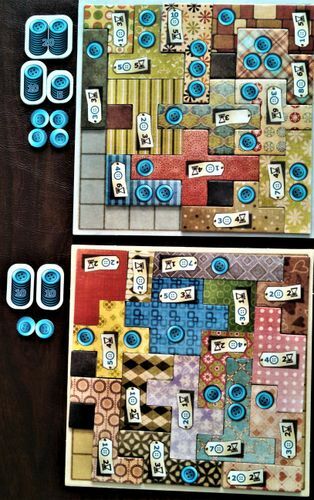 There are not only 3 phases in the game, but 10, one for each "stretch" between buttons on the board. The relative value of the patches changes continuously, based on the number of remaining "payouts". However, the patches have also a fixed component to their value, given by area and cost. Thus some patches are quite high in the "pick order" wherever we are on the board. For example the 0$-3T cross is an high pick everywhere, while the 4$-6T L-shape is pretty "meh" everywhere. I think that all strategic advice is an approximation, really. It's a matter of different degrees of detail and abstraction. 3 phases (opening, midgame, endgame) is a common heuristic model used to talk about strategy in many games... This kind of approach could perhaps be useful and easier to use for those disinclined to do the more detailed calculations based on exactly how many payouts remain, but who nonetheless want some strategy ideas better than a simplistic fixed valuation for each piece. The phase factor is 2 for the first three rounds, 1.5 for round four, 1.25 for round five, and 1 for the remaining rounds. Please try the chart before dismissing it. 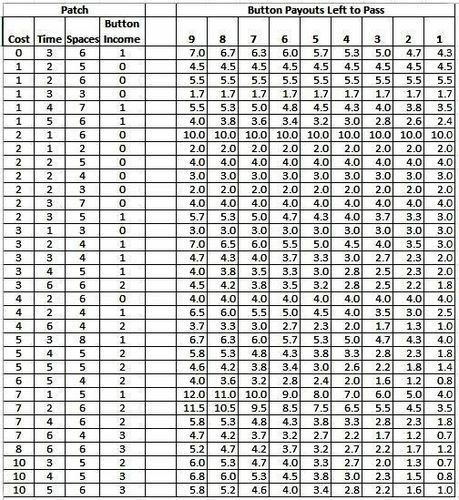 I also generated a button rate per time chart using the formula presented in the strategy post 'A Patchwork Tactic: Maximizing Buttons Per Time. As the title suggests, it was more tactical (how you evaluate individual patches at a particular point in time) than strategic. Edit: missed that mike_s had cited my earlier write-up. Adding more detail for the suggested method of three phases; engine building, then a mix of patches, and then mostly 0 button patches. The chart gives a point value for each patch at different positions on the time board using a formula. I'm trying to make sense of the numbers you're showing under the button payouts, but I'm not getting it. What do those numbers represent? What is your equation? They are the net VP gain per step of each patch according to the remaining income payouts. This is basically the universal way to rationalise the choices in the game. 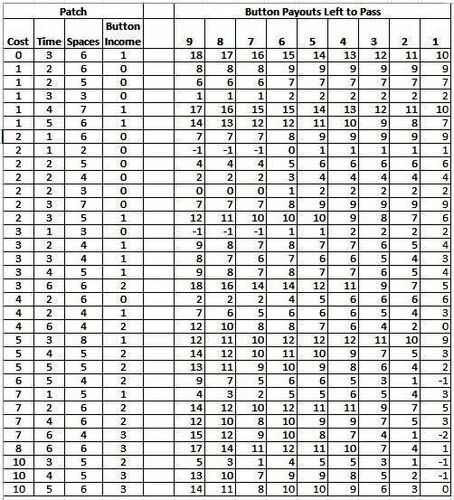 Since you have a fixed number of "steps" to spend in every game (53, aside from last turn shenanigans) and you start at -157 points (5 buttons minus 81 empty spaces), simple math shows that you need to average a net gain of at least 3.5 VPs per step to attain a reasonably good score. 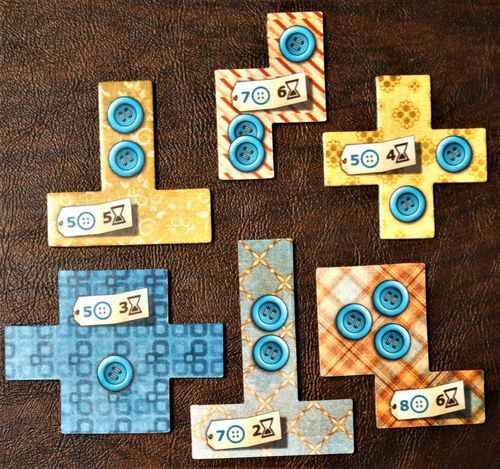 Exept for pieces with no printed buttons (for which BI = 0), BI depends on the amount of remaining payouts, so pieces provide different value depending on the turn they are taken. Of course, the patch providing the highest VP net gain is not always the right choice as there are a few more factors to consider (space constraints, getting/denying a 1x1 patch, denying a valuable piece to your opponent, getting a double turn...). The game becomes really interesting once both players have all these things in mind. Yes, that is obviously what is in his second table. I'm asking about his first table. Please see edited entry above. The thing is that your calculation, even if interesting, doesn't reflect the game's reality. For instance, the 6/4 L-shaped patch is arguably one of the worst pieces in the game, and it often remains unchosen at the end of my games unless it comes very early; and yet according to your scores it appears to be reasonably good. A similar thing happens with the 7/6 and 8/6 patches. On the contrary, the 2/1 S-shaped patch with no buttons printed is probably the best piece in the game, not only because of its high VP value but also for setting up great double turns thanks to its time cost of 1; and yet it scores OK but not too much in your chart. Your system greatly overvalues big patches with high incomes, but the fact is that they're unaffordable at the beginning of the game and quite poor later on, due to providing a not-so-good net gain and having a huge time cost, which may give your opponent the opportunity to pick 2 or even 3 good patches in a row with no opposition. So in summary, I understand some of the assumptions of your method, but I don't think they fit the real game. 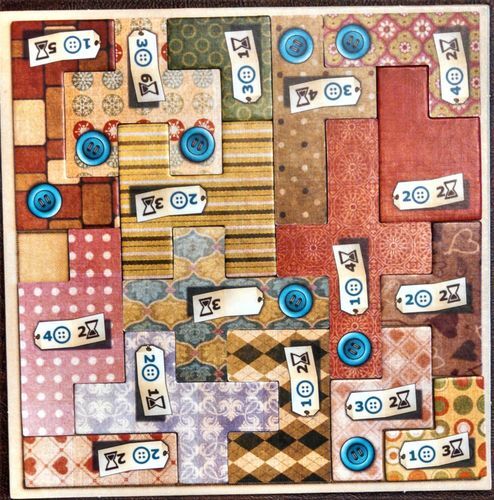 Patchwork isn't a solitaire puzzle in which you can choose the order of the pieces or in which being the richest is the main objective. The objective is scoring 1 more point than your opponent. It's a very interactive game in which you try to choose good pieces that allow you to get enough income and give you flexibility to pick other valuable pieces, while your opponent is trying to do the same. Subtracting out time is nonsensical. It's a wholly different unit of measure. I agree that the game is not solitaire and that one must consider what a pick allows the opponent to do. However patch values can be assigned to help make that evaluation. Your game playing experience is different than mine as to what is leftover and what gets picked early, etc. So I was worried about group think influencing what works and doesn't. I wanted to see what happens if both of the above charts get what it wants during a game. The test had all patches up for selection at all times. Not realistic for game play but it would show something about patch valuation. The final score was 39 to 22 (after deducting for empty spaces)with the phase approach beating the per time approach. Below is the resulting boards with the phase approach as the top board and the button cost per time as the bottom board. The upper board is full of high time patches and the lower board has the low time patches. However it seems to me that it would be easier to place the patches on the bottom board. Overall my opinion is that the tactics of actual gameplay selections and decisions is the most important thing. The phase approach chart is the best one for assessing the impact of a patch on the final score. But I wouldn't let it make the in gameplay decisions for me. It's a totally reasonable thing to do, depending on the situation. 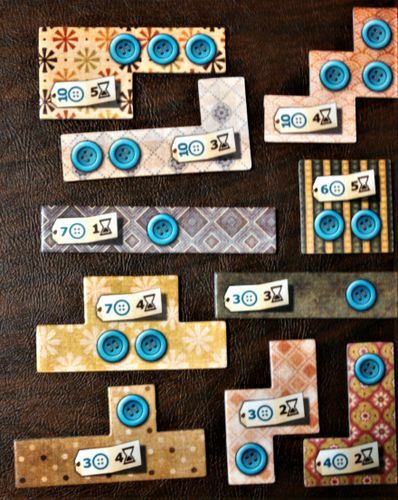 I have never gone a game without taking buttons at some point, so I don't understand how you can call it a "wholly different unit of measure". Points-per-time is a good valuation in middle-game when we are not income-limited, but it's not so useful early on when our priority is income generation, nor near the end when calculations are more explicit. In my experience, methods like this do a better job of baking in oppotunity costs than the points-per-time method. My main question is how to set the fudge factor (2, 1.5, 1.25). It's just set by feel, I guess? If you need to "set a fudge factor by feel," that's a pretty good sign that a mathematical equation is not the solution you're looking for. Well, it's better than just being wrong.